"We arranged Spellbound for my husband's 40th. It was our first murder mystery and it won't be our last. We played Spellbound and it was a lot of fun. Everybody got dressed up and got into character. It was fun watching all the alliances and lying going on. Time got the better of us. I would say it would be best to have a librarian's assistant as there was a lot going on. Looking forward to playing the next one. " "Spellbound was a great game, and everyone enjoyed it (including 6 novices!). I thought the structure, with the regular exam tasks, worked very well. The library was fun too, and enabled me to give a bit of extra help to some people, without being too obvious." "Thought you might like to know how Spellbound went. We played it this last Saturday and I think it went well over all. This is our family's third one of your games we have played in the past year! Bottom line, everyone had a fun night. Thanks for providing great games. Keep it up! " "Thank you so much for creating a Harry potter-esque Murder Mystery. I hosted Spellbound in October and my guests ate it up! While no-one correctly guessed the murderer, they had a lot of fun just plotting and scheming the whole way through." "Spellbound was an amazing game and led to a magical evening full of intrigue and betrayal and enough stories to last the rest of the weekend. Thank you so much." 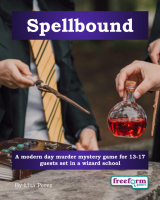 Spellbound is a dinner party murder mystery game for 13 to 17 guests and one or two hosts – download the free introductory pdf file. Join us in an enchanted evening of magic, mayhem, and mystery! You will be in the middle of the action and it will be up to you to wheel and deal with the other guests. Can you achieve your goals, keep your secrets hidden and survive Spellbound? It's up to you. Welcome to the Tremaine School of Magic, which is located within an ancient British castle. The castle is built at the top of a cliff and is miles from the nearest town or city. Students and Professors live in the castle during the school year, but today is the last day of school before summer break. Last night, someone painted a red X on the Headmaster's door. This morning Professor Bennet, the Headmaster, woke up unable to remember anything. Not even his own name! Parents are convinced that the school is under some sort of magical attack, and the professors have announced that if the culprit is not caught, the school will close and will not reopen next year. Professor Riley Karlsen, the most senior teacher, is overseeing investigations. No-one may leave the school grounds before the end of the school day. Anyone caught doing so will be presumed guilty and detained for questioning. Even with all of that going on, today is still the dreaded day of finals. Each professor will give an exam and grade the students' performance, and a full scholarship will be awarded to the student with the highest grades. Let's hope the students' memories are working better than the unfortunate Professor Bennet's! Spellbound lasts for about four hours and is suited to an evening. It is often played over a meal – a finger buffet if possible to allow guests to circulate and talk in private. The free introductory pdf file contains an introduction to the game, a cast list of all the characters, and a copy of the Sorcerer's Scoop – plus details of how to buy the game. Spellbound is unlike many murder mystery games. Although the game starts with the attack on Professor Bennet, most of the characters have more important things to do than to investigate it. And the attacks may not be over – no-one is safe! Spellbound is played just like a murder mystery game. You may be trying to solve the murder, but primarily you are (initially at least) concentrating on your own goals and objectives. Unlike most boxed murder mystery games, Spellbound lets you decide how to achieve your goals and thwart your enemies. On the evening of the game the guests are met by the organizer, the Librarian, and welcomed to the Tremaine School of Magic. They then receive their detailed backgrounds – including dark secrets, objectives and money. The fun then begins as they form alliances, blackmail each other, steal items and maybe even try to attack one another! Depending on what the players choose to do, there are several different possible endings, but finally everyone finds out how they did, and what secrets everyone else was concealing. Spellbound costs £20.00 (GB pounds) or US $29.99. You can buy it in either currency, from anywhere in the world, as you prefer. The price will be converted back into your own currency for you, at today's exchange rate. We offer a Cast Iron Guarantee on all our murder mystery games. If you're not completely satisfied with Spellbound then please let us know within 30 days and we will refund you. See our full terms and conditions here.